Fisher-Price is recalling thousands of Power Wheels Barbie Dream Campers over concerns that the toy vehicle’s wheels may continue to run even when the foot pedal is released. If you’re wondering whether you have one of the recalled toys, check the model number and other details. For example, according to the recall notice, the model number is FRC29. 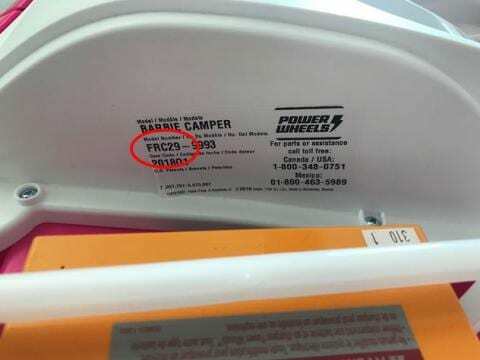 Additionally, the recalled Power Wheels toy has a gray foot pedal, is painted hot pink, and has “blue accents and the Barbie logo printed on the back.” The notice further states the toy vehicles were sold at Walmart retailers nationwide and online between July 2018 and January 2019 for $400. So far there have been 17 reports of the of the toy vehicles “continuing to run after the foot pedal was released.” Fortunately, no injuries have been reported as of yet. However, if you have one of these recalled products, you should discontinue use and “contact Fisher-Price for a free repair.” If you have additional questions and concerns, contact the company at 800-348-0751.